In June 2018, the Sackler Library put up a book display with our staff members’ favourite publiciations housed in the Sackler, with the aim to showcase different disciplines and areas of interest together in one place to spark interest and ideas in readers. This is Louise Calder’s account of her favourite item in our collection. My favourite Sackler book is A Peaceable Kingdom : the Leo Mildenberg collection of ancient animals. It’s a 2004, London Christie’s Auction Catalogue. I first encountered it when Dr Henry Kim, then at the Ashmolean’s Heberden Coin Room, said, “You’ve got to look at this!” He was right. This was at the very, very beginning of my DPhil, and though it was definitely going to be about animals in ancient Greece, I hadn’t yet decided if they would be snakes, or pigs (Professor John Boardman’s idea), or perhaps exclusively pets. At that point of indecision, and doubt about whether I was truly up to the job, this gorgeous catalogue gave me a bounce of delight that helped me into the next stage. For 40 years Leo Mildenberg collected ancient Egyptian, Eastern, Greek and Roman animal representations. Many were already published, but this substantial catalogue offers Christie’s exquisite, high quality images for some of the choicest in Mildenberg’s collection. The pictures breathed fresh life into the objects, just before they disappeared again into secret, private, lucky hands. Lot 111. 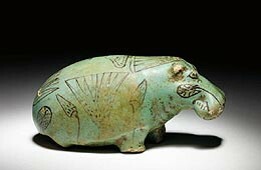 ‘Hubert’, a faïence hippopotamus from the Egyptian Middle Kingdom. © Christie’s Images Ltd 2018. Lot 153. A Mesopotamian inlaid limestone leopard from the late fourth millennium B.C. © Christie’s Images Ltd 2018. During the writing of my thesis this ‘peaceable kingdom’ was a source of refreshment and supporting evidence, not only for study, but recreation too. 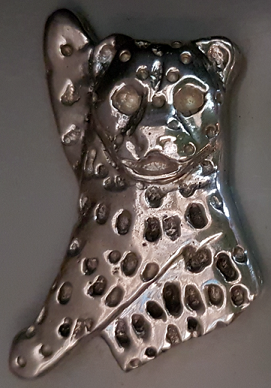 A prancing cheetah on an Apulian red-figure plate (Lot 80) inspired me to make an embroidered name tag (see pictures), and the Mesopotamian leopard in limestone (Lot 153) was my focus for an intensive ‘lost wax’ silversmithing project (see pictures). 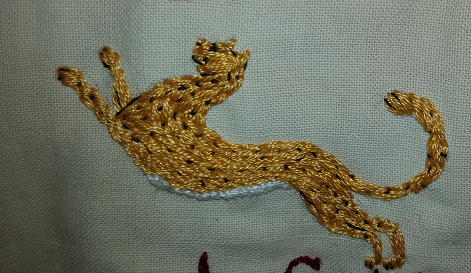 Both leopard and cheetah exemplify a charm and cheer that pervade the collection. They seem to reflect that of Mildenberg himself; delightfully pictured smiling throughout. Back at the Sackler, my colleagues love these ancient beasts too, even down to the issues desk stationery. Among our many novelty items, we have an eraser in the form of a faïence hippo that’s very like one of Mildenberg’s. The eraser is actually after ‘William’, the Metropolitan Museum of Art example, but whenever I see it, I think ‘Mildenberg’, and, funnily enough, Mildenberg named his too: ‘Hubert’ (Lot 111). Lot 80. An Apulian red-figure plate from the second half of the fourth century B.C. © Christie’s Images Ltd 2018. Lot 80 (detail). An Apulian red-figure plate from the second half of the fourth century B.C. © Christie’s Images Ltd 2018. I periodically run across A Peaceable Kingdom in the Sackler. It’s an old friend, and it gives me a sense of contentment and connection whenever I see it. We welcome suggestions for future blog contributions from our readers. Please contact Clare Hills-Nova (clare.hills-nova@bodleian.ox.ac.uk) and Chantal van den Berg (chantal.vandenberg@bodleian.ox.ac.uk) if you would like propose a topic. Calder, L. (2009), Cruelty and sentimentality : Greek attitudes to animals, 600-300 BC. Thesis (D.Phil.) – University of Oxford, 2009. v. 1: Bodleian Library, Offsite, MS. D.Phil. c.22973, Theses 605083196; v. 2: Bodleian Library, Offsite, MS. D.Phil. c.22974, Theses 605083197. (Published as: Calder, L. (2011), Cruelty and sentimentality : Greek attitudes to animals, 600-300 BC. Oxford : Archaeopress, 2011. Sackler Library LG Floor 622.1 Cal. Kozloff, A. 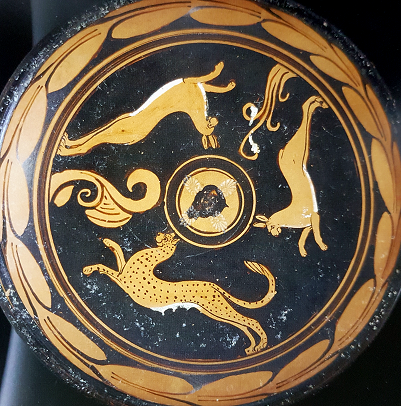 (1981), Animals in Ancient Art from the Leo Mildenberg Collection. Sackler Library 1st Floor J.ii.213f. Avida, U. 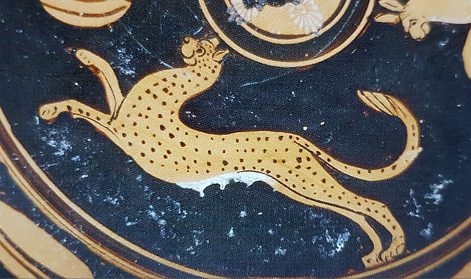 (1986), Animals in Ancient Art. Sackler Library 1st Floor J.ii. pamph. [Mildenberg]. Kozloff, A. (1986), More Animals in Ancient Art from the Leo Mildenberg Collection. Sackler Library 1st Floor J.ii.213fb. Walker, A. (1996), Animals in Ancient Art from the Leo Mildenberg Collection: Part III. Sackler Library 1st Floor J.ii.213fc. 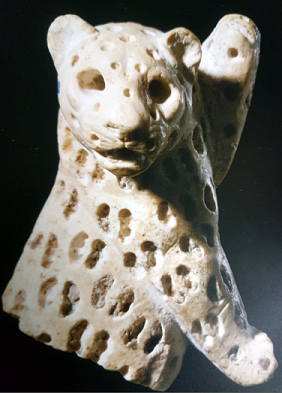 Zahlhaas, G. (1997), Out Of Noah’s Ark: Animals In Ancient Art from the Leo Mildenberg Collection. Sackler Library 1st Floor J.ii.213fe. Biers, J. (2004), Animals In Ancient Art from the Leo Mildenberg Collection Part VI : A Peaceable Kingdom. Sackler Library 1st Floor J.ii.213ff. Posted in Like @ Sac!